This issue marks the first reappearance of Grodd the Super-Gorilla since #115, (my very first issue of the and encounter with The Flash, the heartwarming details of which can all be found elsewhere on on this blog although you may want to wait until I’ve finished tagging everything). What’s cool and one of the things that I relished about The Flash is how the story picks up directly where issue #115 leaves off albeit with a gap of time. The story opens in the state penitentiary as Dawson, the man whose body Grodd’s brain had taken over, is being released (I’ve always wondered where Dawson’s brain went – I smell a story there). Dawson has been becoming more and more hirsute as his gorilla brain has been transforming his body back to its original gorilla wonderfulness. The changeover finally becomes complete when Dawson returns to Gorilla City in deepest darkest Africa after having apparently walked there. As Grodd enters the city, he almost immediately becomes enamored of a female gorilla named Boka, and just as quickly learns that she is the betrothed of Solovar the king of Gorilla City. Grodd immediately returns to his secret lair and invents a machine that can bathe him in neo-magnatism, which will make anyone who sees him admire him uncontrollably and fall in love with him. I can’t tell you what an appealing concept that is to a twelve-year-old, and possibly an insight into the mind of the story’s writer that should best be left unexplored. Needless to say, the neo-magnatism works like a charm and soon Grodd has not only won the heart of Boka but has been crowned king of Gorilla City. Naturally, this is never enough and soon we find Grodd in Central City where he plans to become mayor of the city, and then president of the country, and eventually, with apologies to Leonardo DiCaprio, king of the world. 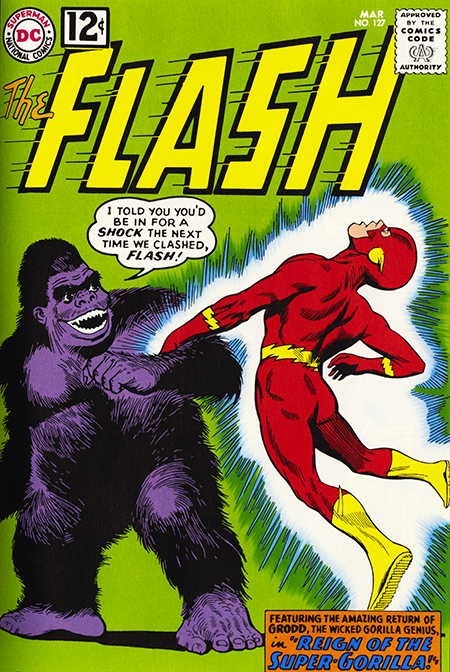 Of course, these shenanigans draw the attention of the Flash who, after several valiant efforts, finally figures out a way to overcome Grodd. The story ends with Grodd behind bars again and a caption that reads: “But is Grodd… behind heavy bars and in a darkened cell to prevent even the sight of him… really helpless? Perhaps… but perhaps not. Our advice is… keep your eye on future issues of this magazine to play it safe!” – which, of course, I was planning to do without being told. The odd thing is that the caption I just quoted was removed from the archive edition of The Flash. Why this would be is beyond me since, in the archive book, all you had to do to see future issues was turn the pages.